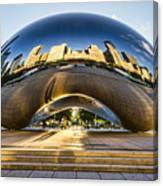 David, thank you for the feature in the Midwest America Photography group. Neal, thank you so much for the feature in the All Things Reflective group. Betty, thank you very much for the comment, like, and fave. Thank you for the feature in the "Landscape and Landmark Photography" group, Judy - I appreciate the comment, too! 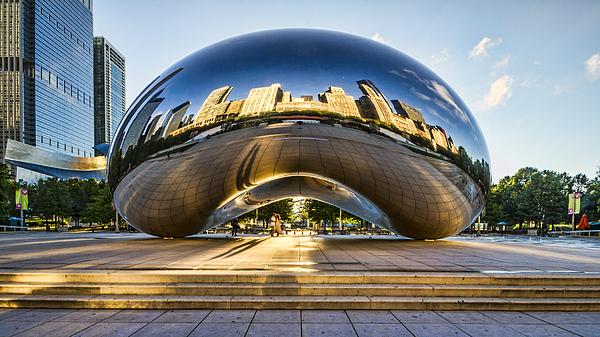 Cloudgate, commonly know as The Bean, is a sculpture located in Millennium Park in Chicago, IL. 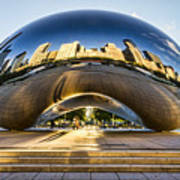 It was created by sculptor Anish Kapoor and was completed in 2006. It is a popular place for people to gather and have fun with reflections and pictures. Early in the morning it is beautiful with the morning sun glowing off the city's buildings and reflected in the sculpture. In this image there is a young couple being photographed for their engagement photos.